How many times have you made a list of new years resolutions and haven’t followed through with some of them, or any of them at all? Every year, people will pick a few resolutions to change their life to make this year the best one yet. We say, all the power to you! HomeHero wants you to succeed with all of your resolutions and we want to see all of the amazing changes that you continue to make on your life throughout the year. Believe me, I know it’s not easy. Whether it is to have a healthier lifestyle, stay more in touch with your family or to face your greatest fear. It’s not always easy to stick with them. Have no fear, I have collected 10 helpful tips to get you through 2014 and help you follow through with your new year’s resolutions. Remember, it’s all about choice and you are the main decision maker. 1. Don’t try to be an overachiever. You don’t have to set yourself up with 20 goals to succeed within the next 365 days. Write down a list of some of your goals and try to compile them into a few smaller goals. For instance, if you are wanting to start a diet, try yoga for the first time and implement an diligent exercise routine, try narrowing it down to ‘living healthier.’ Each day you can then try one new recipe or a new type of exercise that will ultimately help you achieve a healthier lifestyle. Don’t start the year off by setting yourself up for failure right off the bat! 2. Set realistic goals for yourself. “I want to cure world hunger.” This isn’t necessarily going to be a realistic goal. So try something smaller and more realistic. Make it a resolution this year to volunteer monthly at a food pantry or to donate each year to a cause that means something to you. If you set goals for yourself that seem unachievable, chances are you are going to doubt yourself. We want you to achieve your goals and remain as ambitious as possible while trying to achieve them. 3. Do it with a buddy. Everything is more fun when you do it with a friend. Honestly, your goals may be more achievable if you are holding each other accountable. Have your caregiver or a nearby friend be your inspiration. If you work together, then you can track each others progress as your work together towards your goal. **4. Get visual with your resolution. **Sometimes it’s about remembering what your main goal was to really help you stick with it. Throughout the year, it’s easy to get sidetracked with your daily life or having to take care of other responsibilities. Post a sticky note by your bathroom mirror or keep a photograph on your refrigerator. That way, every time you go to one of your usual places during the day, you get a visual reminder to call your grandkids to see how their test went or if that girl he liked in school said yes to prom. 5. New years day is just like any other day. So your resolution was to be better at budgeting your money throughout the year and you went ahead and treated yourself with a new purse. Listen, it’s alright for their to be falls throughout the year while you complete your journey. It happens, but the important thing is to remember that just because you had a fall doesn’t mean you have to wait until 2015 to start again. 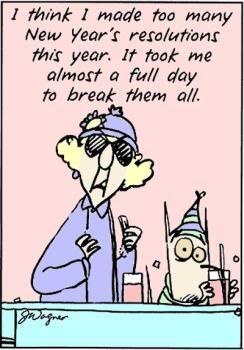 New years day is just like any other and you can start over right now! Don’t let a slip get you discouraged. 6. One resolution at a time. Floss everyday, quit smoking, take the bus, finally do your taxes, get organized… do you see where I’m going with this? You have your list of resolutions, but they don’t have to start all at once. Create a schedule for yourself. It takes about thirty days to truly get into the habit of a routine, so each month try to add on a new part of the routine. Give yourself time to get acclimated to one of your goals as to not overwhelm yourself. 7. It’s time to celebrate your success. Give yourself any reason to celebrate. Have a mini ceremony for yourself on new year’s day by kicking it off with a cheers to you! Have you made it through the first week? Celebrate! Keep rewarding yourself for the progress you are making, we understand that whatever your resolution is may not be as simple as black and white. Make benchmarks for each of your resolutions to celebrate the progress that you have made. You will find yourself in a place that is happier with other parts of your life too that are definitely worth praising. 8. Stay positive. Happiness is the key to success. Keep yourself inspired and motivated by watching a funny movie or reading quotes about determination. Positive and uplifting moments will be the ones that give you the honest boost you will need to keep going. So turn on your favorite song that makes you feel empowered and dance around the room. You’ll feel better that you did. 9. Overexertion is a killer, literally. The body needs what the body needs. Don’t over stress yourself, deprive yourself of sleep or the necessary nutrients just because you are trying to actively achieve your resolutions. By stressing yourself out and trying to overexert your body and mind you can put yourself at serious risk. Understand your body when it is telling you that you are tapped out. Getting a good night’s sleep after a healthy meal will refocus you as it begins to fuel up again. 10. Ask for support. Not every resolution you may have will be something you can do on your own. Perhaps you will be needing to join a support group to help you quit smoking or to talk about some underlying issues that you have refused to deal with for years. It’s important to know that you don’t have to deal with anything on your own and you most certainly aren’t alone. More than likely, there are many people out there trying to succeed with the same resolutions as yourself. Sure it’s not easy, but by following some of these guidelines as you make your new years resolution list this year, it can definitely help. We are so proud of you for taking the next steps to success. We believe in you, and I believe in you.